The Passat G3 is based on the original Passat hull, acclaimed by adventure racers (Dual first place in the Yukon River Quest). A slight increase in overall depth, an increased spread of cockpit locations and custom curved bulkheads creates a true 3-hatch (3 Cockpits with optional seat) racing and expedition tandem. The Passat G3 has greater stability than most singles. It tracks well, with or without the rudder, edges easily and effortlessly tours at 5 knots. It is safe, strong and seaworthy even in challenging waters. It has become Seaward's best selling composite kayak. This kayak’s "Greenland" style bow, sleek graceful lines, solid feel and expedition capacity make a combination of speed, comfort and storage that is unrivalled in a touring double/triple. 16"L x 10.5"W 338 ltrs 90 LBS. In the name of Seaward’s newest tandem, the Passat G3, you can hear echoes of two other brands, Volkswagen and Apple – two hip, sophisticated companies that like each other so much they have recently paired up on the `Pods Unite’ promo campaign. One puts flower holders in their Beetles; the other designed an operating system that, in the words of Steve Jobs, “looks so yummy you just want to lick it.” The Passat G3 is a slick kayak from Seaward made with a similar attention to doodads and detail. 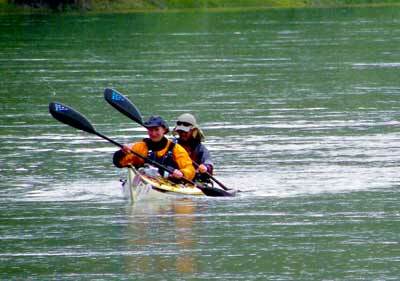 The original, two hatched Seaward Passat is a narrow, fast tandem kayak popular with the Adventure racing crowd. The new G3 has the same sleek design, just puffed up and tricked out with a bit more volume and a centre/hatch cockpit providing room for dogs, children, or easily accessible waterproof storage for long trips. All this and it’s only five pounds heavier than a regular Passat and still slim enough to race. The G3 comes with standard Seaward features like nylon cockpit covers, hand layup, fiber glass seams and bulkheads, Kevlar reinforced bow and stern and a plastic stern skid plate. It’s also available with a cornucopia of upgrades from dual steering to yummy colour fades and Kevlar layup for about a thousand bucks extra. At only 26 inches wide, the G3 is as narrow as many singles with performance to match. Playing in waves and currents, we had a great time carving sharp eddy turns with an extreme tilt, using the double’s speed to blast through power moves that we could never make in our singles, and feeling generally invincible with the size, stability and inertia of a double. The G3 is truly a lot of fun. The Passat G3 is the Euro-station wagon version of the kayak world – the performance car that you buy when you have a family. It lets you have the sporty speed and trip with it too. Beetles and I pods sold separately for now. Seaward’s own smartRUDDER system of pivoting pedals is a secure alternative to sliding foot pedals. The pedals are built of hard anodized hardened marine aluminum covered with non-skid tape. Pivoting the ball of the foot forward cranks the rudder while keeping the foot arch, heels and knees solidly braced. Sensitive West coast company Seaward anticipated the `divorce boat’ potential of tandems and offers an optional dual steering system that allows control from either cockpit. ($224 Cdn). We can think of no better way to introduce the next generation to the wonders of kayaking than to sit them in the G3’s optional fiber glass ventre seat ($144 cdn). At first they ‘ll love it, and by the time they outgrow it they’ll be big enough to get a kayak of their own. Ma and Pa can jettison the seat and have 180 litres of dry storage in that empty nest for a long expedition. The extra large opening is perfect for packing awkward items, and seals like any ordinary storage hatch complete with a neoprene inner and fiber glass cover. With the centre hatch the Passat G3 has 348 litres of dry storage in total – 115 litres more than the standard Passat – and less cockpit area to flood if you flip. Both front and stern cockpits are large enough to fit folks up to six foot two, possibly bigger. Seawards seat are unique – removable fabric covered foam cushions that sit right on the bottom of the boat. The cushions are designed to be unclipped from the boat for use as an instant paddle float (or camp chair). Clever! This system trades the rigid support of a plastic bucket seat for a soft and roomy feel, fitting all sizes of derrieres and making it extra easy to add more foam for a complete custom fit. I don't think I got back to you after out trip from Kitimat to Telegraph Cove last summer. I LOVE the new seat. It easily doubled or tripled the time I can spend comfortably in the boat (I think we did an uncivilized 6+ hours one day). I am thinking we have somewhere around 10 months in that boat and 8,000-ish km. Still going strong.